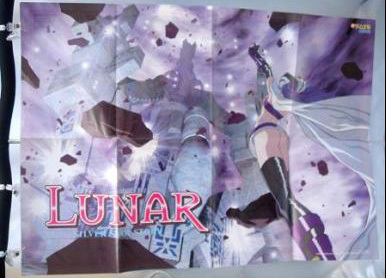 These posters are probably not the only posters of LUNAR, but they were the ones we could get our hands on. 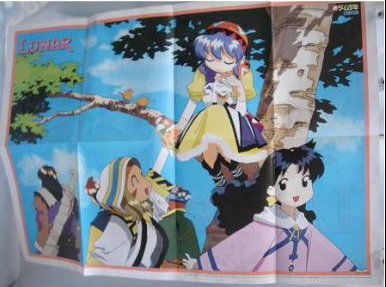 Some of these come from Working Designs, which are no longer available. If anyone knows of any other posters and can give us information on them, please contact us. At one time Working Designs had a few more posters for purchase, but they're no longer for sale. We've now also added a LUNAR: LEGEND poster that comes with the import strategy guide for the game. Check the bottom of the page for it. 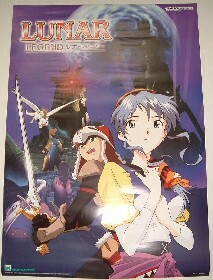 On top of that, we've also added a rare promotional poster from All the Lunar, along with two new posters. 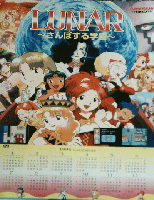 One featuring the classic EB remake artwork with Lucia and Hiro on the Blue Star, and the other is a chibi poster of Lucia and Luna sitting on a moon. 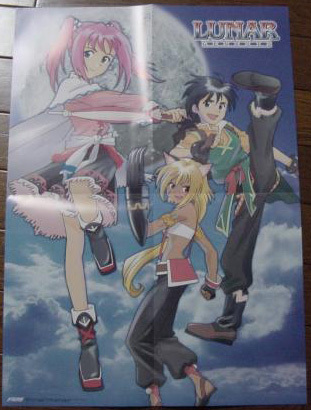 The latest edition, as of February 2005 has a really old LUNAR: Walking School poster that we found off of Ebay. It's listed as the second to the bottom on the right side.